Add variety and spontaneity to vocalic /r/ drill with your favorite card games! The card decks are organized like authentic decks of playing cards to give a huge range of practice possibilities. Each deck has 52 unique pictures and two joker cards. 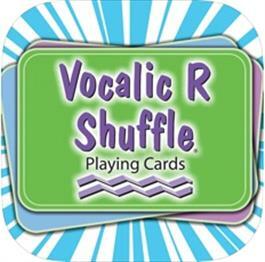 There are single and multi-syllable words with vocalic r in all positions. Each deck has four suits and is numbered just like an authentic deck of playing cards. The game possibilities are endless. Deal a hand of Go Fish, Crazy Eights, or War. Play memory games by matching suits, numbers, and face cards. Mix sounds from different decks to accommodate varied student goals.